Advanced staff training eLearning courses designed to simulate unscripted interactions between the customer service/sales rep and a customer. Using data collected in the training to predict the outcomes of the training. 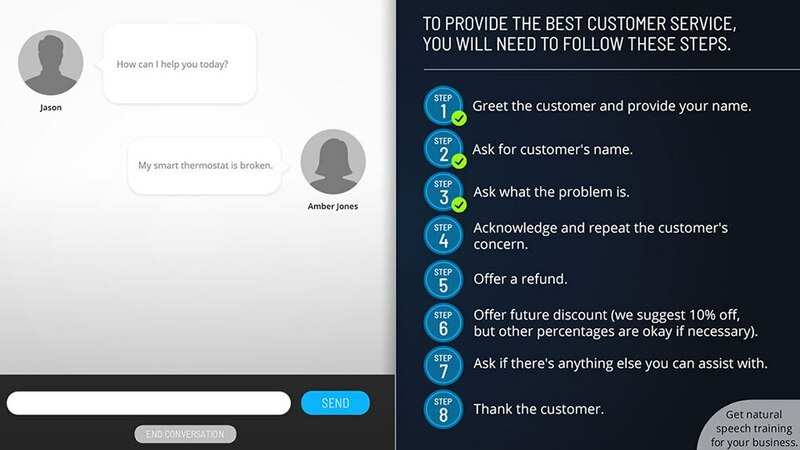 The unscripted dialogues allow to experience real-life examples of employee-customer interactions, practice various responses, and learn the sales scripts without risking to lose a real customer. The learner can receive instant feedback resulting in faster learning and improved training outcome. In addition, the service can provide future training recommendations to staff and supervisors. Each interaction within a training can be recorded and used in future analysis that can show how the training is used, and whether the outcomes align with business goals and expectations. Provided by eLearning Company, Inc.